A bajillion years ago I read a book called Kitchen Confidentialby Anthony Bourdain. I think it was towards the end of the book that he goes to The French Laundry, a chi-chi restaurant in Northern California, helmed by a cat named Thomas Keller. As a fellow chef Bourdain was allowed to witness the pristine majesty of the kitchen, oh so different from his practice and experience in kitchens. Bourdain was a bit in awe at the flawless execution, the immaculate workspaces, and the calm industry. It was the first time I had heard of Thomas Keller. I was amazed at the similarities between us. Over the years I read articles or interviews or watched tv shows mentioning Keller or The French Laundry. I think I even know someone who has eaten there. It is renowned for its perfection of execution and taste. They use the quarter inch dice there to check the accuracy of the ruler. The first line of his biography on thomaskeller.com is “Thomas Keller is renowned for his culinary skills and his exceptionally high standards.” He has held 3 Michelin stars longer than any other American chef and has so many awards and accolades you have to scroll for 37 days to get to the end of the biography. Ok, not really, my real talent is hyperbole. And how awesome is that word – hy-per-bol-EE, fantastic. Keller also owns a family-style place called Ad Hoc. I don’t know if my family would eat it, and I think they are pretty adventurous, but it is for sure more casual than The French Laundry. At least as far as I can tell from the website. Our glorious little public library has a pretty fine cookbook collection that includes the Ad Hoc cookbook, Ad Hoc At Home. And a few years ago, in pursuit of perfection I checked that bad boy out. It only made sense, that I, so akin in sophistication and manner, should be able to master one of these great creations. Or rather because I liked the cover and thought maybe I had a small chance of making something correctly. It was a success. 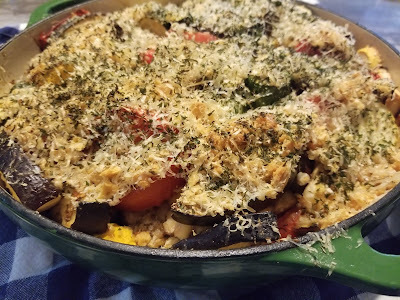 I found and made the recipe for Summer Vegetable Gratin and it was wonderful. It became a staple recipe in regular rotation in our house. My kids don’t eat it. Last year I heard a bit of a podcast with Keller discussing making a recipe your own. He described following the recipe until you know it; then cooking it without the recipe; using your intuition and own tastes and once you have it just as you like it, the recipe becomes yours. Summer Vegetable Gratin is mine. I tried to find the podcast link. I have no idea where it was or how I found it, I just remember not really having the time to listen and feeling like I was cheating on life. Maybe, in a way, Keller would approve of my version. Part of me would like to know. ü Preheat the oven to 350°F. Set a cooling rack on a baking sheet. Heat about 2 tbsp canola oil in a large pan over medium heat. Add onions and garlic, and season with salt. Lower the heat to medium-low and cook onions until translucent but without browning, for about 20 minutes. Stir in 1 tbsp of the thyme. ü Combine the yellow squash, zucchini, and eggplant in a large bowl, toss with the olive oil, and season with salt. ü Drizzle the slices of tomatoes with olive oil and season with salt. Combine the Parmesan, bread crumbs, and remaining 1 tsp thyme in a small bowl. ü Spread the onion mixture in the bottom of a 13 1/2-by-9 1/2-inch gratin dish or 13-inch round shallow baking dish. Layer the vegetables in the dish, working on the diagonal. Arrange a layer of overlapping slices of one-third of the zucchini around the outside edge of the dish. Sprinkle 2 to 3 tbsp of the cheese mixture over the top. ü Make a row of overlapping slices of yellow squash slightly overlapping the zucchini, and sprinkle 2 to 3 tbsp of the cheese mixture over the top. ü Make a third row with overlapping slices of tomatoes, slightly overlapping the zucchini, and sprinkle with cheese mixture. Do the same with the eggplant and continue making overlapping rows of the remaining vegetables, and sprinkle the top with any remaining cheese mixture and a light sprinkling of salt. ü Bake for 1 to 1 1/2 hours until the vegetables are completely tender and offer no resistance when pierced with a knife. Remove from the oven and let rest for 10 minutes. Turn on the broiler. Just before serving, place the gratin under the broiler to brown the top. I tried my best to follow the recipe to a T. I know the first time I made it I didn’t have all the ingredients just as listed. I don’t think the store had a Japanese eggplant. I couldn’t, and still can’t, quite figure out the layering around the pan in thirds and then sprinkling partial layers? Whaaaa? Keller’s recipe calls for a large pan, 3 bowls, and a gratin dish. Soooo many dishes. And then the broiler. This is a summer recipe and this is the South. The oven being on is enough. I don’t know where the cooling rack on a baking sheet comes into play. ü Preheat oven to 350 if you remember. ü In a large oven safe pot, like a Dutch oven, saute onion and garlic in 2 tablespoons of olive oil over medium to medium low heat until translucent. Try not to let them brown, if it starts, turn the heat down and stir. If it gets a bit brown, not the end of the world. If it burns, start over. Stir in 1 tablespoon of thyme or other herb and salt to taste. ü Meanwhile, chop the tomatoes, zukes, yellow squash, and eggplant in as close to similar sized pieces as you can manage. Tomatoes in wedges, zukes and squash in slices, and eggplant in pizza shaped wedges. No more than ½ inch thick. Ish. Chuck it all in a bowl, drizzle with olive oil, and sprinkle with salt, toss. ü When the onions and garlic are done, remove from heat and spread them evenly on the bottom of the pan. Unceremoniously dump the bowl of vegetables on top of the onions. ü Sprinkle with panko bread crumbs, then the cheese, and top it all with another tablespoon of thyme or other herb. Maybe a drizzle of olive oil here. ü Bake for about 1 ½ hours until the veg are fork tender, especially the eggplant, that will cook slowest. · Everything in this recipe can be found at the Fort Thomas Farmers Market, including the cheese and the bread crumbs if you make your own from Blue Oven bread. Ok, you have to go somewhere else for olive oils and salt and pepper if you don’t already have them. · I have used every type of tomato I can lay my hands on for this including cherry and except green, and I was tempted to used those when I made a batch for this article. Roma is actually my least favorite. Try a brown or yellow tomato. · I have used many types of eggplant, including tiny finger sized ones I just cut in half. 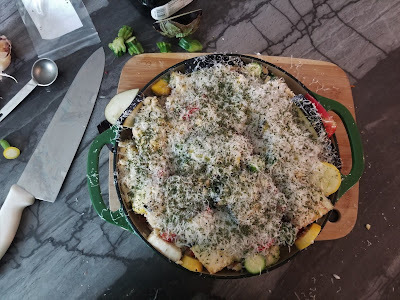 · I have also used patty pan squash and prefer it. Patty pan holds a better texture than yellow. They are the space ship looking squash at market. Get ‘em. 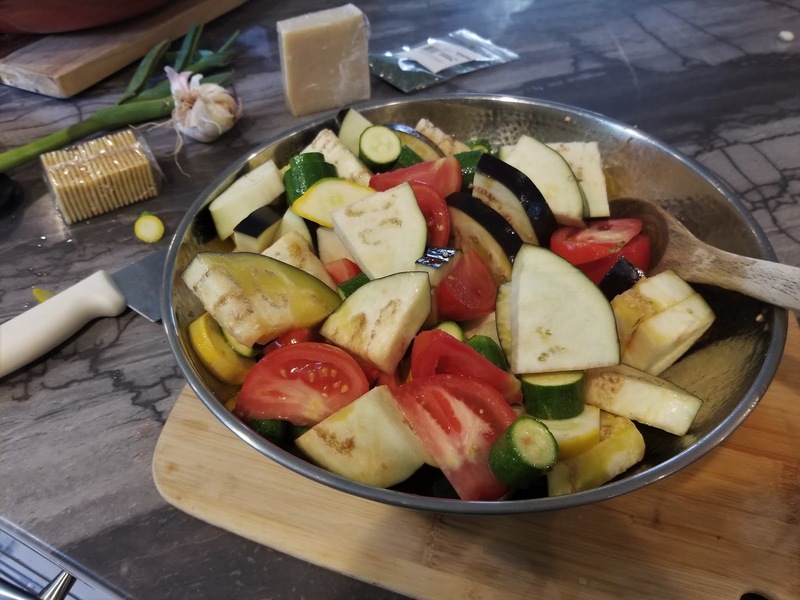 · I have only used zucchini for the zucchini. · I have used many different bread crumbs, from regular to butter crackers to chopped toast. Panko has a great crunch, butter crackers are surprisingly delicious, I suspect saltines would be fantastic. None ain’t bad either, not as creamy the next day. · My ratios vary pretty decently based on what looks good at market and what I am in the mood for. Eggplant and tomatoes usually outweigh squash, but that may change since I started using patty pan. · I have only recently started playing around with the seasoning. I have always loved the simplicity of flavoring this dish. I have tried Herbs de Provence (a blend of rosemary, thyme, savory, fennel seed, basil, lavender, and marjoram) and Simon and Garfunkle (parsley, sage, rosemary, and thyme – isn’t that cute?) from Colonel De. I really liked Simon and Garfunkle and will keep using it. Guaranteed to not make you shorter or make your hair go fuzzy. · This is one of my favorite leftovers. It is delicious cold and travels well to the pool. The bread crumbs soak up the juices and everything becomes kind of creamy. · Like I said my kids won’t eat it. Instead of cooking another vegetable for them I serve what we call “Shaker bowl”, a shallow bowl (or whatever you’ve got) with some combination of raw carrots, celery, olives, artichoke hearts, pickled beets, cucumbers, cherry tomatoes, snap peas or raw broccoli or whatever raw stuff that grew in the dirt that kids like. There is rarely any kind of dip, that is where the pickled veg and olives come in, dresses the veg just enough. A version of this is served at Shaker Village, thus the name, and we all love it. I also will put one on the counter if dinner is late and folks are getting hangry. My kids still have to taste whatever concoction I make, actual swallowed bite, but they don’t have to like it. · Don’t let thinking a recipe must be made perfectly stop you from making a recipe. There is a quote from Keller on the Philosophy section of his biography, and whether you go for trying the “Before” and nail the vegetable layout and figure out what to do with the cooling rack, or the “After”, and make a big ole mess; this will make people happy. As long as those people are not my kids, who are over seeing this on the table.